Johnny Cash (left) behind his boyhood home in Dyess, Arkansas and Daisy Bates in front of Central High School in Little Rock. A bill advancing through the Arkansas Legislature would place statues of the two in the U.S. Capitol in Washington, DC. On Wednesday, SB75 was presented to the House Committee on State Agencies and Governmental Affairs. Speaking of behalf of his bill, Sen. David Wallace recalled making his first visit to U.S. Capitol in 1973 and seeing where each state has two statues. "I saw folks like Thomas Jefferson, I saw Joseph Wheeler who is from Alabama, I saw Frederick Douglass, and I got to Arkansas and I thought to myself, who are they? And I’m a history buff. I love history," Wallace said. On display representing Arkansas are Uriah M. Rose, who was a 19th century attorney, and James P. Clarke, who served as governor and U.S. senator in the late 1800s and early 1900s. "We’ve got statues of two men that were great men in their day. I don’t have any complaints with them, but those statues were put up over a hundred years ago, and I believe that Arkansas needs statues that when our folks go to our Capitol they can walk in and they can recognize those individuals," Wallace said. He explained that members of the Arkansas Senate chose Cash and Bates after nominating 12 notable Arkansans. A secret ballot was then used to select the top two. Wallace then spoke about the two people he would like to now represent the state. On Daisy Bates, an activist and writer who mentored the nine black children who desegregated Little Rock’s Central High School in 1957, Wallace called her, "A lady with a lot of courage. I spent 21 years in the Army. I’ve been in combat. I understand what courage is. Daisy Bates did things that I’m not sure I would have had the courage to do." Then-Gov. Orval Faubus had called out the Arkansas National Guard to keep the black students from entering the previously all-white school, in violation of a U.S. Supreme Court order. President Dwight D. Eisenhower responded by sending in members of the U.S. Army and federalizing the National Guard to ensure the students could attend. Sen. Wallace said in the face of all that, Bates never waivered. "She escorted the Little Rock Nine. They would meet in her house. She would walk them through lines of an angry mob, walk them back every day. She coordinated that and it made a significant change in the state of Arkansas." On Johnny Cash, who is one of the few singers to be inducted into both the Rock and Roll Hall of Fame and Country Music Hall of Fame, Sen. Wallace said, "He has all the good qualities of the folks of Arkansas, and he’s got a few of the warts that some of us have." Sen. David Wallace and House sponsor Rep. Jeff Wardlaw speaking to the House State Agencies and Governmental Affairs committee in favor of the bill. Some members of the legislature have previously questioned whether Cash is a proper role model, given his public drug addictions and other issues in his life. But he continues to have an influence in music more than 15 years after his death and Wallace noted that he often spoke about his upbringing in Arkansas and some of his songs were set in the state. "He was born in Kingsland, Arkansas, moved very quickly to a little, small place called Dyess Colony that was literally carved out of the Mississippi Delta in the New Deal program under President Roosevelt," Wallace said. "His family was given 20 acres. They cleared that land, they worked it. Johnny Cash chopped cotton, he picked cotton. He has songs about the Delta. The song 'Five Feet [High] and Rising,' that talks about the Mississippi River when it was flooding and in the Delta, we see that over and over and over." Rep. Jim Dotson, R-Bentonville, said he has no problem with Bates or Cash, but asked if the House could get the opportunity to choose one of the two people who will represent the state. Rep. Jeff Wardlaw, R-Hermitage, who is supporting the bill in the House, suggested that would take too much time at this stage in the legislative session. "I understand where you’re coming from. 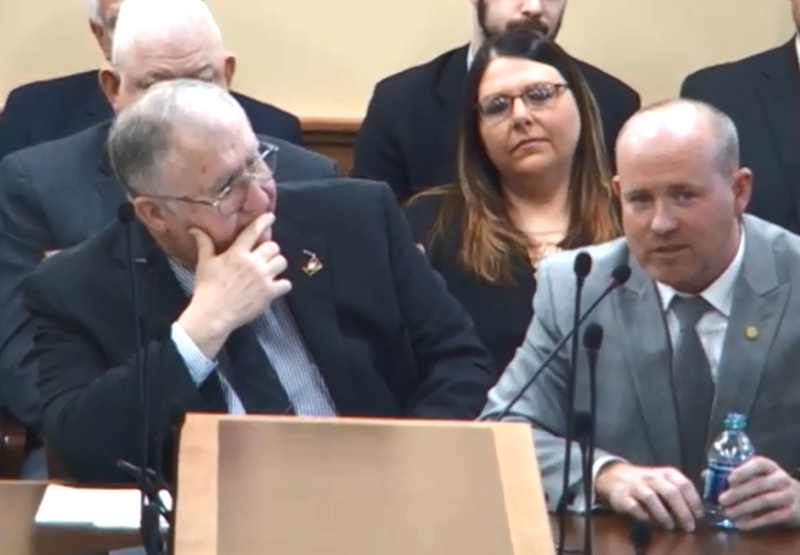 I serve in the same chamber that you do, but I would tell you that if we feel like this is necessarily" Wardlaw said, "we ought to start the process over again. But we’re at a critical point in the session today, and I don’t know that we could go through all that." Rep. Richard Womack, R-Arkadelphia, took issue with that, telling committee members, "I would love to see this just pulled down and offer a quick amendment in a couple of days, and I don’t think there’s any issue in getting it out. That’s just my thoughts. The way it stands right this second, I would have to vote no for that reason." The bill then passed on a voice vote with some members clearly voicing "no." After being told his bill had passed, Wallace said, "Thank you Mr. Chairman. I hear that train a comin'," a reference to Cash’s song "Folsom Prison Blues." Singer-songwriter Rosanne Cash took part in a fundraiser Thursday evening at the Arkansas Governor's Mansion in Little Rock to benefit the ongoing restoration of her father Johnny Cash's boyhood home in Dyess, Arkansas. Gov. Asa Hutchinson invited her to hold the event there, calling the Cash house, which has been turned into a museum, "a great asset for the state." Arkansas State University bought the dilapidated home in 2011, carefully restoring it to how it looked when Johnny Cash lived there with his parents and siblings. Fans have long traveled from around the world to see the small farm house in northeast Arkansas that Johnny Cash often talked or sang about. After years of restoration work, it is now officially open as a musuem. A grand opening ceremony was held Saturday, drawing a large crowd to the town circle in Dyess.